Notes: The author is the editor of the online zine Deadman's Tome, and he's published several of my horror stories over the last couple of years. 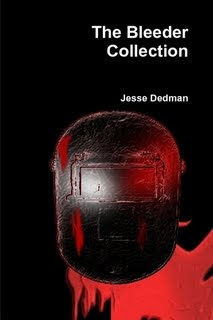 A while back Jesse asked to read, and then review, one of my novels. Which he did. He reviewed my fantasy novel "City of Rogues," and I thank him for that. During our back-and-forth e-mails, he mentioned to me he had put together a collection of stories, each based upon one of his short stories, "The Bleeder." That's this collection I'm reading now. And I thank Jesse for letting me read it. When I'm finished, I'll let you know what I think below. Mini review: This struck me very much as a graphic novel, though it is told in prose form. The imagery and the style of writing lend themselves very much to a hardboiled horror tale with touches of vigilante justice, reminding me somewhat of James O'Barr's "The Crow" series back in the 1980s. Dark, bloody and sometimes disturbing, the stories here have their own inner structure, combining and blending words in ways that are archaic and brutal and even sometimes almost nonsensical, but it works. You can feel yourself inside the Bleeder's head, and the pain and torture and numbness that rushes through him. I look forward to more, if it is to come. One of my rabbits died yesterday, 24 hours ago almost to the minute of when I'm writing this. Her name was Zoey. She was a crazy little girl who liked to flop her ears around and have fun, and she will be missed by myself and my family. At least I know she is no longer in pain. In the picture are Silky on the left and Zoey on the right. Silky is still with us, the rascal, and Zoey's sister Chloey is still around. Notes: Yep, I'm still continuing my Malazan reading. This is the third book in this series, but now the fourth in the series (and the fifth Malazan novel overall) that I've read. Good stuff. 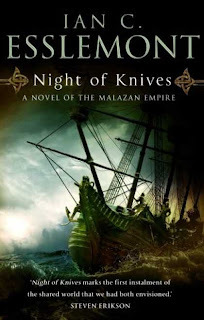 Mini review: I loved the first half of this novel, then got bored with it for a couple of hundred pages, but then it turned around and had one of the best endings I've read so far in any of the Malazan novels. I was looking forward to taking a break from Erikson's writing as I didn't want to become burnt out on the series, but now I'm left wanting more! Maybe a short break won't hurt, but I've got to get back to the next book. Notes: Though Steven Erikson is the author generally noted for his lengthy fantasy series on the Malazan, his is a shared world with author Ian C. Esslemont. I've now read four of Erikson's novels and probably will read more of them (if not all) before the year is out, but I wanted to check out Esslemont's Malazan books, too, mainly to see how another writer handles this dark fantasy world. This particularly novel takes places sort of between the prologue and chapter one of Erikson's first Malazan novel, Gardens of the Moon, if I understand correctly. Mini review: I can readily recommend this novel to any fans of Erikson's Malazan series. The writing here is very similar, so much so I almost have to wonder if Erikson didn't help out a bit along with an editor. Where Erikson's lengthy Malazon novels usually focus on a hundred different people, this one focuses on ... oh, only fifty or so. But the storytelling techniques are the same, and it's worth it. 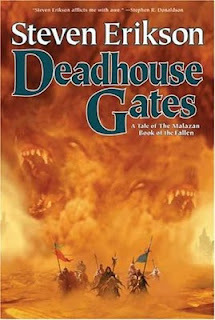 I'm sure to look for more of Esslemont's Malazan novels. by Terry Weible Murphy with Edward E. Zine and Michael A. Jenike, M.D. Notes: A family member suffers from a mild form of Obsessive Compulsive Disorder, and he has quite often mentioned this book when discussing his situation with me. It sounds interesting enough, a man who suffers an extreme form of OCD and the help he recieves from a doctor, so I thought I'd check it out. I expect to learn much. 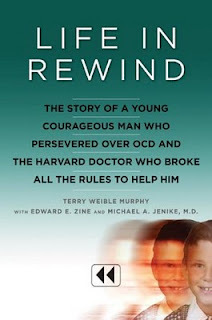 Mini review: An interesting look at one of the worst cases of OCD I've ever heard of, possibly ever recorded. And also interesting in that I could see some minor similarities between Ed Zine, the OCD victim in this book, and my family member who has OCD. Glad I read this book. Not only did I learn some things, but it opened my eyes and made me take notice of things I hadn't before. That's when and where my story "Bullets for Amy" takes place. Oh, and the story has also been accepted by the fine folks over at Arkham Tales. I don't know as of yet when the story will appear, but sometime over the next year. I'll let you know more when I know more. Forgive me for a moment as I talk religion a little, not something I usually bring up here on this blog. But I don't mean to propose my questions only as a matter of spirituality, but also as a matter of reason. My main question: Does God have a plan for all of us? For each of us? As individuals? Personally, I go back and forth on this one. I'm not here to argue for or against a belief in God or Christianity or any other religion. For the sake of this argument, let's just say we all believe in the Christian God. That being said, does God have a plan for each and every one of us? Sometimes I feel the answers is yes. Other times, God seems remote and uninterested, much like most Deist versions of God. Most times when I see or hear someone talking about God's plan for them, it's in a positive light. God helped you get your new car. God helped you get a new job. God had your boyfriend propose. Etc., etc. I generally don't believe God makes a habit of intervening regularly in our lives in such a manner, but maybe so. But good things don't happen all the time, and few people truly have a happy ending. We all die, after all. So what if God's plan for you is for you to die a horrible death, burning alive in a car crash? Tortured slowly by a serial killer? Mauled by a bear? Blown up by terrorists? What if that's your role to play? But then one has to ask, does one's death (or form of death) provide the answer? The old person who dies quietly at home in bed surrounded by family might have fulfilled their role years ago. But why do they live much longer? Or perhaps all of us has more than one role to play? Maybe each of us has many, possibly even millions, of roles to play during our lifetimes? Maybe they aren't seemingly big, important, world-changing roles. Maybe they are small roles. Maybe something as simple as being kind to another in even a small manner is part of God's plan. After all, most of us aren't kings or presidents or generals, etc. But maybe each of our little roles are more important than the supposed great big roles. And maybe sometimes even those horrible deaths can be a part of the plan, even if we don't recognize how or why. Or maybe not. Just an idea. My 15,000 word story "Carcass and Mallet" has been accepted by Rogue Blades Entertainment for its anthology "Roar of the Crowd," coming out later this year. I'm looking forward to it! Not only was this story written specifically for this anthology, but RBE is one of the strongest and most exciting of the Sword and Sorcery markets available. To the editor: Jason, thanks for the acceptance! And everyone else, don't forget to order your copy! Notes: The second book in this series, though the fourth I've read. I'm enjoying this series quite a bit, and now I'm trying to read in order the books I haven't read. Mini review: This is my second favorite of the novels I've read in this series, with The Bonehunters being my first (and which I'll probably re-read later this year since I'm more or less reading this series in order now). The characterization was very strong here. The plotting too was strong, but I felt some of the endings (they're several endings here for multiple situations and characters) were a bit on the weak side. However, the outcomes for a couple of characters were quite strong (Coltaine and Duiker, for those familiar with the series) and very well written. 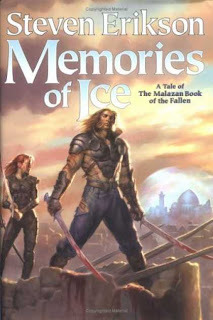 I can't wait to read more in this series, and some of the other books set in the Malazan universe (not all the books are directly part of this overall series).